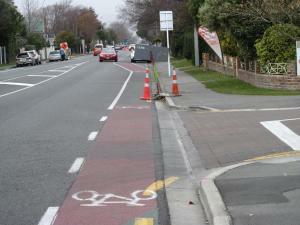 Sent to Christchurch City Council 22 sec later. City Care have placed a detour sign at the corner of Papanui Rd & Halton St so it leans across and blocks the northbound cycle lane. As it has been leaning over and blocking the cycle lane since at least 17th June 2015, City Care either haven’t done any inspections of their temporary traffic management or they must consider the location and angle of this sign to be safe and compliant with CoPTTM. Maybe they could let me know which of these two options is correct (as well as move the sign away from the cycle lane and onto the footpath at the corner where the footpath widens)?